You may have heard that the tax reform that was passed at the end of 2017 will have a dramatic impact on tax filers moving forward. Although most people will be benefiting from lower taxes than in previous years, there are still key strategies that are relevant to review as you prepare for the end of the year. I will layout 16 simple year-end tax planning strategies that range from maximizing your tax efficiency, tax reduction, tax neutral, and possibly higher taxes as a part of a long-term plan. 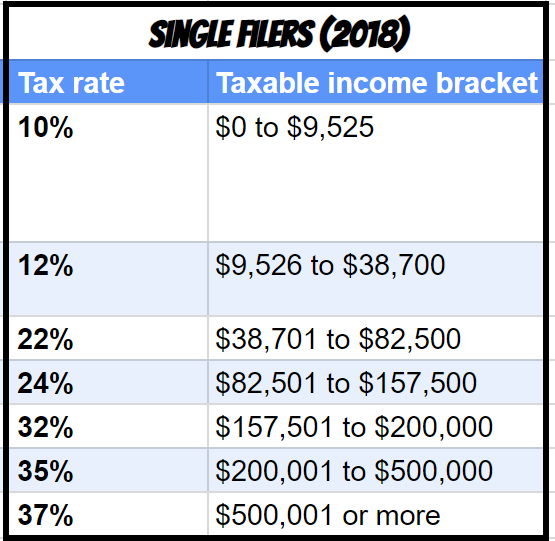 Before we dive in you may be interested in seeing the current tax brackets for 2018. I view tax efficiency as a way to take advantage of your unique tax situation for the current year without permanently missing out on opportunities once January 1st hits. 1. Tax Loss Harvesting- Do you have investments held in a non-retirement account that have a negative value? If you sell these investments at a loss, then you can use those losses to offset gains on your other investments or some of your ordinary income. 2. Avoid Purchasing Mutual Funds- Many people do not realize how tax inefficient many mutual funds can be. Avoid making the mistake of purchasing a mutual fund that may be forcing a significant dividend or capital gain distribution. 3. Gift Giving- This is a popular option for those who have significant assets and are afraid that their beneficiaries may pay a large inheritance tax at some point in the future. The current gifting rate that you can do without it counting toward the estate tax calculation is $15,000 per recipient per giver. That means you can do double the amount if you have a spouse. 4. Bunch Itemized Deductions- The new standard deduction was a game changer for those who previously itemized deductions. As a result, you may not receive the benefits you would have received in previous years for normally itemized deductions that do not pass the new limit. However, you may be able to strategically bunch deductible expenses into a single year and benefit from itemized deductions this year and not next year. This is beneficial because you may fall just short of itemizing deductions both years, which are essentially wasted deductions. 5. Review FSA– Although this does not impact your tax situation, this is a strategy that avoids you wasting money. Flexible Spending Accounts are a unique benefit that you have received a tax deduction already for your contributions. Any balance greater than $500 is lost forever on January 1st, 2019 because only $500 is allowed to roll into the new year. 6. Delay IRA Distributions- This strategy is more relevant for those who are already retired. If you have already drawn a lot of income for 2018, you may want to delay large withdrawals from your account until 2019. 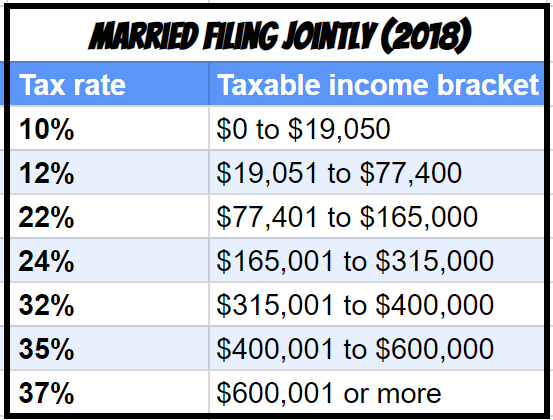 This makes sense if you had unusually high income for 2018 and expect your 2019 income to be lower. A tax reduction strategy is something that will instantly reduce your taxable income. You may find this visual for contribution limits helpful. 7. 401(k) Contributions- If this strategy makes sense, you do not have much time to make the changes. Your 401(k) only allows you to contribute through your paycheck and may have a paycheck delay before it is active. 8. IRA Contributions- If you are eligible to make deductible contributions (there are income phaseouts), this strategy is a great alternative to end of year 401(k) contributions. You have the flexibility to fund this account however you want and also have until the tax filing date of April 17th, 2019. Be sure that any contributions made in 2019 that you want to be applied to 2018 are categorized accurately when you make your deposit. 9. HSA Contributions– If you are using an eligible High Deductible Health Plan, then you can contribute to a Health Savings Account and receive a tax deduction. Unlike IRA and 401(k) accounts, your funds are withdrawn tax-free if they are for qualifying health expenses. Unlike the FSA account mentioned previously, your balance in the account does not have to be spent down in order to avoid losing your funds. These are a no-brainer if you have already accumulated medical expenses for 2018, you can easily contribute to your account and then turn around and reimburse yourself for those expenses. 10. Charitable Giving- Although this technically is related to bunching your itemized deductions, I feel that it is super important to be aware that because of the new standard deduction, you may no longer receive a tax benefit from your normal charitable giving. Charitable giving may be one of the easiest ways to bunch your itemized deductions. Not only can you simply pull future year charitable giving to the current year, but you can also pool these itemized deductions into a donor-advised fund, which allows you to take the deduction for the current year but control the distributions to occur over time both now and in the future. A tax neutral strategy is one that will not necessarily reduce or tax situation for 2018 but will allow you to reposition assets into accounts that better fit your long-term financial plan. 11. Roth 401(k) Contributions- It is a shame that many employers do not offer this option, especially if you are a young professional at a lower tax bracket than where you project to be in the future. Like the Traditional 401(k) contributions, you do not have much time to make this work for you since the contributions need to come directly from your paycheck. 12. Roth IRA Contributions- You want to make sure your income does not exceed phaseout thresholds. Just like IRA contributions, you can fund this account any way you prefer and have until the tax filing date of April 17th, 2019. Confirm your contributions are categorized for the 2018 tax year. 13. Selling Non-Qualified Investments/Contribute to Tax Deductible Account- One of my favorite strategies that not many planners or accountants implement with their clients is the tax rate arbitrage of selling non-qualified investments and contributing the proceeds to tax-deductible accounts. 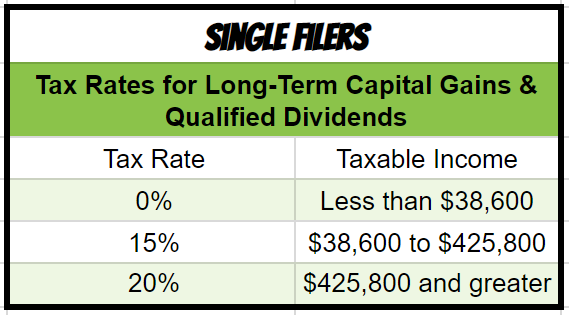 This makes sense if you are in a higher tax bracket than the long-term capital gains (see brackets below) rate that will apply to your sales. The biggest catch is that your contributions to income deductible accounts means you will not have access to those funds until retirement or until you incur medical expenses in the case of an HSA account. 14. Backdoor Roth- An advanced tax planning strategy that many implement, if they are facing the income phase out limits for regular Roth contributions and their contributions to IRAs, are non-deductible. There is way too much to dig into here, but here is a quick overview: Contribute to IRA when your contributions would be non-deductible due to income phaseout limitations. Next, you implement a Roth conversion. I will be sure to crank out a new strategy guide that focuses on the ins and outs of this strategy. Why would you want to increase your tax? Maybe if you feel that your future tax rate will be greater than it is today. Strategically maneuvering assets into a Roth or out of non-diversified employer stock may be a great strategy for your long-term financial plan. 15. Roth Conversions- (See:Should I Do a Roth Conversion This Year?) This tax strategy is great to implement if you expect your future income to be taxed at a higher rate. Another time this strategy is attractive is if you experienced a unique situation where your income dropped either from a career change or a gap in employment. One of the biggest regrets that my clients in their 30’s and 40’s share with me is that they did not make Roth Contributions earlier in their career. Unlike Roth Contributions, there is no income limit to implement Roth Conversions, though there may be an income level where you experience diminishing returns. There also is no cap on the conversion amount. 16. Exercise Stock Options- Depending on your current tax situation, you may wish to exercise your stock options prior to the end of the year and recognize the taxable income that is generated by the difference in the current price of your stock and what you paid for it. This makes a lot of sense if you expect your taxable income to be greater in 2019. 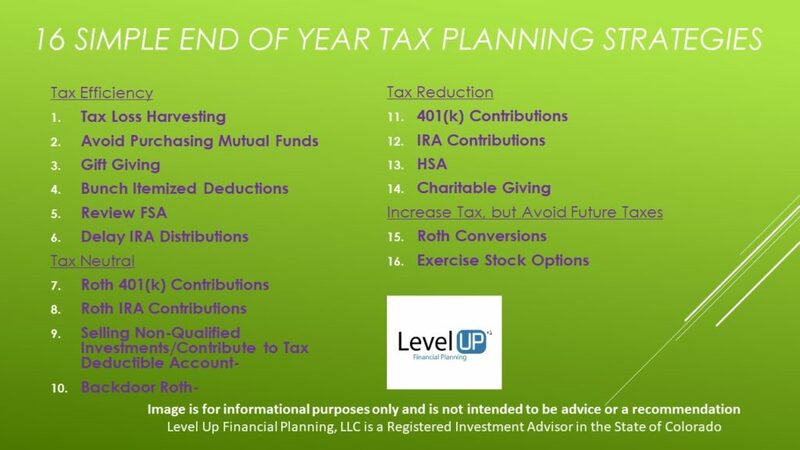 Year-end tax planning is a huge opportunity to take advantage of any of the above strategies that match your current financial situation. If one of the above strategies applies and you fail to implement you could be leaving thousands of dollars on the table that you will never get back. You may have noticed that although the strategies above are generally easy to understand if they apply to your situation, they may not be simple to implement on your own. Be sure to work closely with your financial planner or accountant to avoid making a planning mistake. As always, I would welcome the opportunity to help you with your tax planning and more importantly a plan that allows you to take your financial confidence to the next level!